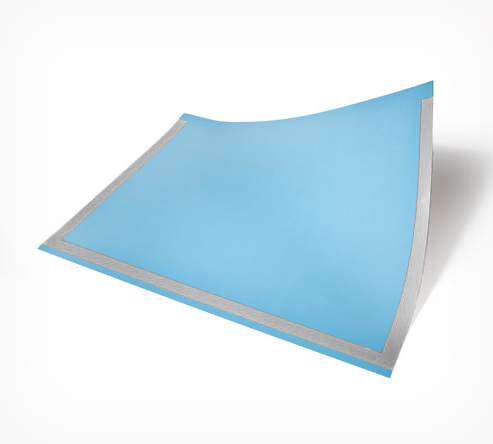 VARNIBLUE 195 HQ has a light blue color and has been designed to replace rubber strippable blankets with fabric base used for coating applications, incorporating the same advantages of coating plates of 1.15/1.35 mm thickness. VARNIBLUE 195 HQ is made of 5 layers and the top coating surface is produced through extrusion without solvents released in the environment. This new Kruse product is made like the usual coating plate plus a compressible layer underneath the first top layer to provide the best coating transfer on paper and carton. The stencil depth of VARNIBLUE 195 HQ of 1.00 mm gives easiness and high quality in cut and peel both spot and fl ood coating areas. VARNIBLUE 195 HQ has a total thickness of 1.95 mm similar to the gauge of standard offset blankets but with the carrier made by a 0.35 mm bioriented polyester used in the place of the cotton plies of the blanket gives an absolute dimensional stability. VARNIBLUE 195 HQ caractheristics offer no orange skin in coating transfer due to excess of pressure or no ink build up on the plate surface and is fully compatible with Water based and UV coatings. VARNIBLUE 195 HQ replaces the coating blanket without modifying the cylinder packing and clamps setting and no need for compressible underblanket like VARNICOMP because the compressible layer is built in the product, therefore manila papers can be use for setting.